Pickled ginger, or sushi ginger, is called ​gari or shin-shoga no amazu-zuki in Japanese. It's served with sushi or sashimi; the ginger’s spiciness and sweet vinegar flavor cleanse the palate in between eating different types of sushi, allowing you to enjoy the taste of different kinds of fish and rolls. Gari is also great with century eggs, which are a Chinese delicacy. Although you can find prepared pink or white pickled ginger in most Asian markets, it is simple to make your own. The success of the recipe, however, hinges on using fresh young ginger. The young ginger’s skin is very thin and easy to peel with your fingers or a spoon and is thinly sliced and then marinated in sugar and rice vinegar mixture. Wash the young ginger root and scrape off any brown spots with a spoon. Then scrape off all the skin with a scraper, or peel the ginger by hand. Slice the ginger thinly and salt the slices. Leave salted ginger slices in a bowl for about 1 hour. Dry the ginger slices with paper towels and put them in a sterilized, heat-resistant container or jar. Mix the rice vinegar and sugar in a pan and bring to a boil until the strong vinegar aroma has evaporated. Pour the hot vinegar and sugar mixture over the ginger slices. If you want to keep the ginger spicy, pour out the liquid after about 1 minute. Otherwise, let the mixture sit for 2 to 3 minutes. Drain the slices in a colander and let them cool by placing them on a paper towel in a single layer. The pickled ginger should change its color to light pink; if you are using old ginger, it might not turn pink naturally. With clean hands, squeeze the liquid out of the slices and place them in a jar. Cover the jar and store it in the refrigerator, where it will last in the refrigerator for up to 1 year. Young ginger is harvested and sold in early summer. It has a mild ginger flavor and a fine fleshy texture that is tender, unlike matured ginger usually used for cooking. Look for ginger with the pinkish tips, which will make the pickled ginger naturally pink. (Some of the commercially produced and sold pickled ginger is artificially dyed.) You can find young pinkish ginger in Asian grocery stores. 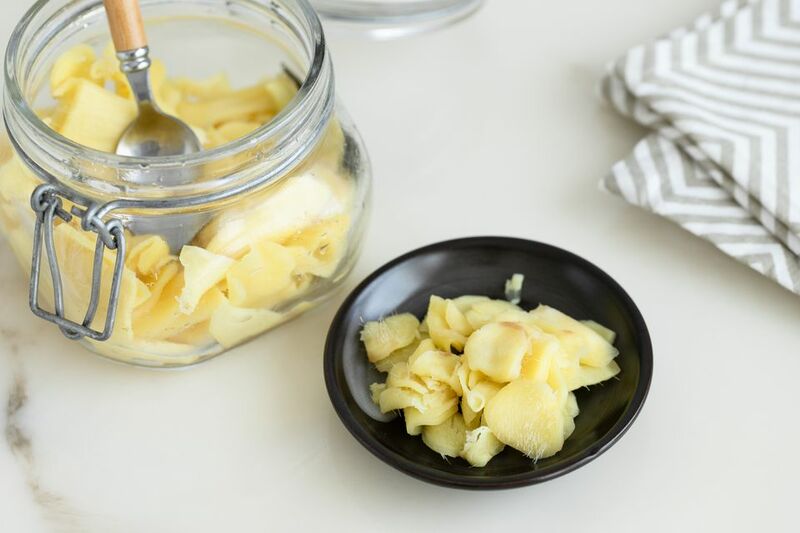 If you find yourself with extra fresh ginger and would like to try to use it differently, there are plenty of ways to preserve fresh ginger, from freezing it for later use to drying it to add to baked goods to fermenting it into real ginger ale.